It was Woods’ 78th victory in his 300th start. Coincidentally, Woods won on his 100th start on the PGA Tour, as well as his 200th. The win also puts him just four wins behind the all-time PGA Tour wins mark of 82 set by Sam Snead. But the win on Sunday spoke volumes more than a 78th Tour victory. It spoke directly to those who thought he was done winning. It spoke to those who thought that he would never reach that level he was before. Sure, it wasn’t a Major Championship, but it was a victory over the best field that golf sees all season long, Majors included. It was a victory on a golf course that many felt didn’t suit Woods’ game. 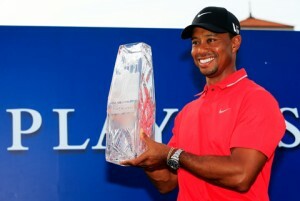 This was Woods’ fourth victory in 2013, and is the fastest he has ever reached four wins in a year. And while the No.1 ranked player in the world held the trophy on the 18th green, many had the same thought on the mind. The site of the 2013 U.S. Open is a traditional golf course and will not play nearly as long as some of the previous U.S. Open courses we’ve seen. In fact, it will be a similar driving set up at TPC Sawgrass. Woods hit only a handful of drivers all week long, which will be along the same lines when he tees it up at Merion in about a month. The last Major Championship Woods won was in 2008, nearly five years ago. The win at the PLAYERS Championship on Sunday though perhaps sent the loudest message thus far to his fans and critics alike. And that is that we can expect to see performances like this in the future, and that we might only have to wait another 30 days until we see that Major Championship drought come to a resounding conclusion in Pennsylvania.